She placed seventh on the fifth season of Bravo’s Top Chef, then returned for Top Chef: All Stars. Now Jamie Lauren (above right) is back on reality TV—this time behind the camera. Lauren is a culinary producer for MasterChef and Top Chef Duels and supervising culinary producer on The Taste. 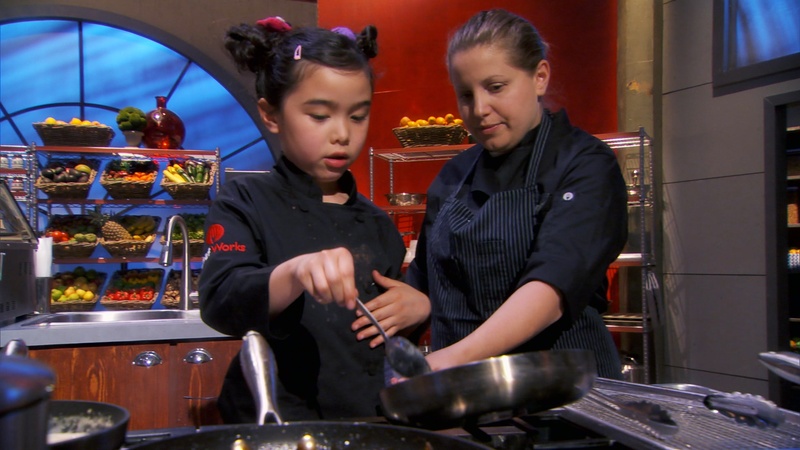 Her latest series, Man vs. Child: Chef Showdown (Thursdays, 9/8c, FYI), pits established chefs against kid cooks. Lauren tells us how she went from restaurant to TV kitchen. Anything food-related falls under my umbrella. I have an ingredient team and an equipment team.The ingredient people make sure we have everything in for the staple pantry – the pantry that never changes – all the produce, the flour, the sugar, the vinegar, the basics. And all the extra stuff we put into the challenge, because each challenge is a different theme. There’s three challenges in an episode. We're also responsible for creating all the reveals for the show too. There's a lot of running around and sourcing ingredients. Working with purveyors and making sure we get beautiful stuff. Obviously it’s television so we can’t have anything that looks like crap out there. It has to be gorgeous and look nice on camera. On the equipment side, it’s making sure we have everything for specific challenges [like a sausage grinder]. Also, a big part of our job is the "Greeking." What is “Greeking”? It appears to be important. I don’t know where the term comes from, how it was invented. That means everything with a label has to be taped over, since you’re not allowed to show brands unless they’re a sponsor. Then we have to make sure everything is open, and we have to make sure there isn’t foil on anything. I’ve been a chef for 17 years. I went to culinary school, worked in San Francisco for 10 years as an executive chef and then moved to L.A. SF for 10 years as an executive chef, and then moved to LA. Took chef positions in LA but they didn’t go the places I wanted them to go. For whatever reason when I got to LA the food scene was teetering on being amazing. Now, it’s finally getting there. I want to get back into the restaurant industry, there’s some amazing stuff happening. But I was in between jobs, and Sandee Birdsong [former Top Chef contestant and also a culinary producer] asked me to come work on The Taste. I knew Sandee because all the contestants on Top Chef all know each other. I knew nothing about behind the scenes, I only knew what it was like to be a contestant on a show. I got there, and figured that I was going to be a production assistant. But I was made an associate producer. And that was the first season of The Taste. I couldn’t believe it. This is what producing a show is like, there was no expense spared. To have all of these amazing ingredients at our disposal. They get used for one shot and then it's brought back to culinary and they're like, "you guys can take this home now." It was awesome! That part, I was shocked at. How much excess product there was. And I also couldn’t believe how much went into making a show.That opened the door. I never thought this would be my career. What's it like working on Man vs. Child? I would say of everything I've worked on this has been my favorite. It’s nice to come to an environment where you like the people you work with. The hours are long. Sounds like a chef’s life. It’s exactly the same. Well, as a chef I never had to be at work at 7 a.m. Unless I was doing brunch, which was always the dreaded shift. But on average my days start between 6:30 and 8 a.m. And depending on how the day goes, sometimes I don't get home until 9. It’s a long day. 12 and 14 hours. By the time I get home I'm so tired. Not at all. My big meal of the day is here on set and it’s from catering. No offense, but catering is catering. By the time I get home I’m too tired to cook. On the weekends, when I have a weekend, it’s nice. It’s rare. But food is my life so I’ll go somewhere nice to eat. I want to eat well when I’m not working. And then I love cooking at home, I just can’t do it when I’m tired. It’s hard to muster the energy sometimes. Do you get to eat contestants’ food? We’re discouraged from eating the contestant food. I don’t want my staff distracted by eating. We have very limited time to reset for the next round. So out of all the shows I’ve done, I haven’t tasted much of anything. I’ll get a look at something and look at how they're cooking something, so I can usually tell if something is going to be good or not by looking at it. But tasting it doesn't usually get to happen. You also appear on Man vs. Child. I’ve been a sous chef on the show a few times. It’s fun to see them grow, get better, learn the techniques and see how they can get better. I run circles around them, but it’s still fun. Would you have gone on one of these shows as a kid? I don’t know. I think I would be scared. But when I was 10 I did take a cooking class. This was before being a chef was cool. Now being a chef is cool. Why wouldn’t you want to be on TV now?